Kevin Durant proves he's the embodiment of the self-conscious athlete. Is that a bad thing? Kevin Durant proves he’s the embodiment of the self-conscious athlete. Is that a bad thing? Durant definitely cares what people think about him and doesn't hide it well. It’s human nature to be self-conscious, caring about what others think of our lives, our deeds, our actions, our perceived slights, misgivings and flaws. Is that what drove Golden State Warriors megastar Kevin Durant, arguably the second-best basketball player in the universe, to have what people are now calling a “burner Twitter,” where a player’s actions could be defended or praised anonymously? 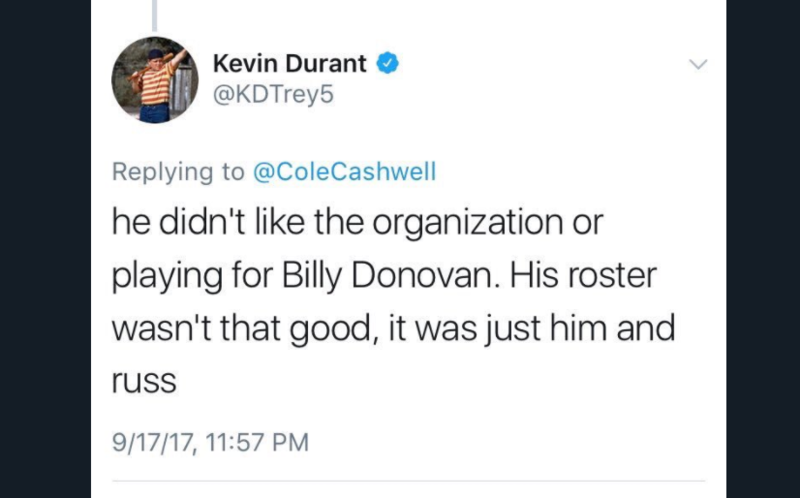 Durant was caught red-handed over the weekend bashing former Oklahoma City Thunder coaches and teammates from his own account when he seemingly meant to tweet from some other account and forgot to switch when he sent out the damaging tweet, which he quickly (but not quickly enough) deleted. It’s almost impossible to believe that Durant is the only NBA player who employs this burner social media practice — Durant may also have a fake Instagram account as well — but he’s certainly the most prominent player caught in the act. But why feel the need to have to defend yourself and your public perception at all? All NBA players are motivated differently, but nearly all the greats have that competitive drive, which is manifested in different and unique ways. Michael Jordan seemed like a petty a–hole, and that’s what drove him. LeBron James prefers the art of the subtweet to motivate teammates or to get his point across, but has turned off all social media for the playoffs during recent years to regain his focus. And Kobe Bryant had his notoriously famous drive and desire, and whatever the hell the Musecage is. Perhaps these passive-aggressive actions on social media is how Durant copes with the rigors of an NBA season, or the pressures that come with being one of the singular basketball talents of his generation. Maybe what other people think and how he responds to his critics is what fuels him, or how he deals with the massive expectations heaped upon him since high school. But this is far from the first time Durant’s self-consiousness has played out publicly. But he clearly cast aside these self-conscious thoughts, worrying about what people think, and went through with leaving for the Bay Area to focus on winning championships, something he clearly felt he couldn’t accomplish in Oklahoma City. And he accomplished that, bigly. Durant almost seamlessly incorporated into the Warriors’ team-oriented approach, a significant departure from how things operated with the Thunder, and put together one of the great NBA Finals performances in league history. He averaged 35.2 points, 8.2 rebounds and 5.4 assists per game on 55.6 percent shooting from the field and 47.4 percent from three against Cleveland, including the massive fourth-quarter 3-pointer in Game 3 that will probably stand the test of time as the signature moment of June’s NBA Finals series. Was there an impetus or a purpose to saying something like that? And why is there a need to still deride his situation with Russell Westbrook and the Thunder in September 2017 — and need a fake Twitter account as his outlet, to boot — coming off a well-earned championship run, the first of what seems like many with this unstoppable Golden State roster? Even with the perfect team situation, a new two-year, $51 million contract with the Warriors, taking less money in order to free up salary cap space for others, there’s still these lingering self-conscious, subconscious actions emerging in the public forum from Durant, begging to be dissected, parsed through and examined from every conceivable angle. 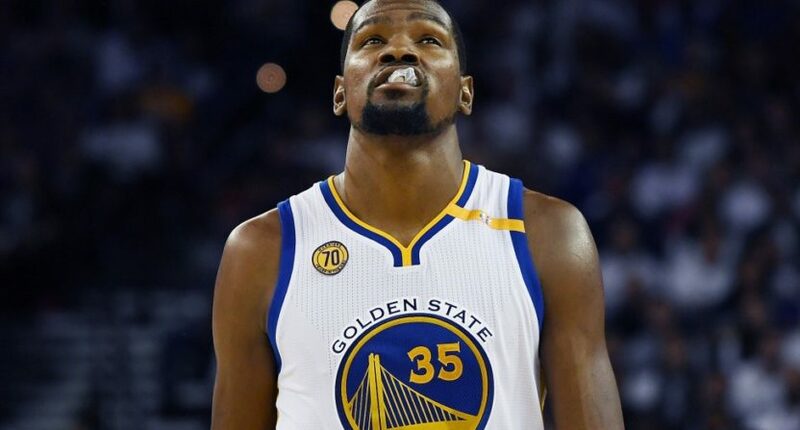 Oftentimes, and it certainly seems to be the case with Durant, all the money, fame, power and success in the world can’t totally shield or hide people from their own insecurities, vulnerabilities and self-consciousness. We all have our flaws in this world, and it seems like Durant’s most prominent, public flaw (if it even qualifies as such) is that he’s more than proven that he’s the current embodiment of the self-conscious athlete in this ever-pervasive social media age.